Edited 3/26/07 to add materials and instructions for a front view bunny pin. Round 1: 2 sc in 2nd from hook, sc next 2 st, dc in next 2 st, 7 dc in next st, dc in 2 st, sc in 3 st, slipstitch in top of first sc. Round 2: Ch 1, 2 sc in 2 st, slipstitch in next st, sc in next 2 st, 2 dc in 9 st, sc in next st, slipstitch in next st, 2 sc in next 2 st. Join with slipstitch in top of first sc. DO NOT fasten off. Ch 5, slipstitch in 2 nd and 3rd ch from hook, 2 sc in next st, hdc in last ch, slipstitch in next st of head. Slipstitch in next st of head, ch 7, slipstitch in 2nd and 3rd ch from hook, sc in next ch, sc dec over next 2 ch, hdc in last ch, slipstitch in next st of head. Fasten off. Using beginning tail, working on back, weave in stitches of round one to close any gaps in center. *Ch 5, slipstitch in 2nd ch from hook, sc in next 2 ch, hdc in last ch, slipstitch in next st of head. Slipstitch in next head st and repeat from * for second ear. Fasten off. Finishing:Using beginning tail, working on back, weave in stitches of round one to close any gaps in center. Glue (or sew) pin back to wrong side of head. Glue pom pom to bottom on right side for tail. 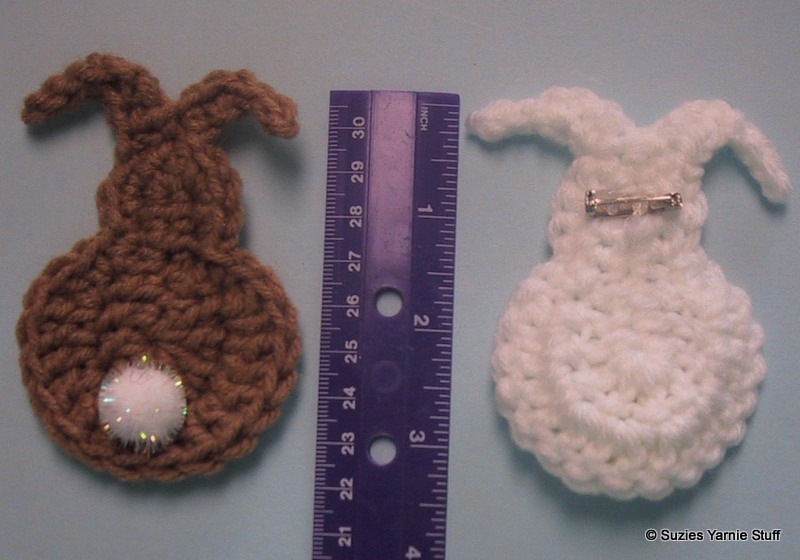 For a front view bunny glue 2 4mm wiggly eyes and a 4mm pink pom pom for nose to face. Make a bow out of 1/8 inch ribbon and glue to neck. For fridgie glue a magnet to back instead of the pin back. Very cute. They look easy and fun to make. Keep up the good work. I just love this! Thanks for your sharing spirit!